Life can leave you feeling depleted and weary. Work is stressful. The kids won’t listen. You’re buried in debt and barely making ends meet. You begin to feel like you’ll never get it all done and you’ll never measure up. By the end of the day, we often find ourselves feeling maxed out, overwhelmed, or lost. But God whispers to you, don’t give up. There are many ways to say it. Keep going. Don’t stop. Hang on. Hold fast. Stand firm. Our circumstances may look different, but the message of faith never changes. Don’t give up. In the Don’t Give Up Study, bestselling author and pastor Kyle Idleman will encourage you to cast your concerns on God, trust in his love and timing, pray for patience and strength, and seek out support in the family of God. Drawing inspiration from biblical heroes and testimonies of perseverance, journey through Hebrews 11 and 12 and let your loving Father carry the weight that has been holding you back and keeping you down. 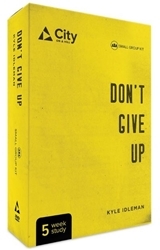 Contains 1 Don’t Give Up Series, 1 Don’t Give Up Leader’s Guide, and 1 Don’t Give Up Journal.